Pan searing is an art as well as a science mastered by few though most of us claim to do it correctly. The more delicate is the fish meat, the trickier is the pan searing process. Today, we're going to look how we can pan sear a fish to perfection. Normally, fish is pan seared in two ways. Either with a coating or as it is with minimal seasoning. In both the cases, the general searing guidelines are more or less the same except some subtle changes. Sometimes, the methodology also changes a bit depending on the type of fish we're using. We're going to focus on searing fish fillets instead of whole fish. 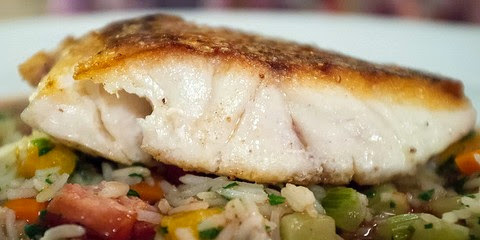 So let's get started and see how we can quickly make a perfectly pan seared fish fillet in an easy way. Whether the fish fillets are coated with batter or you're taking raw fillet with mild seasoning, make sure to freeze it for at least half an hour before you start the searing process. This will ensure that the fillets get some firmness and don't break if the fish meat is delicate. Take a heavy-based skillet that heats up evenly. This is necessary to get the best results as the fillets are evenly seared to perfection. Whether you're using nonstick or general cookware, use a generous amount of oil to ensure fish is seared well in it. Avoiding oil or using very less oil may not give you the desired results. Start with the skin side of the fillet and make sure the temperature is high while searing the skin side. Sear for at least 3 to 4 minutes till the side is done before flipping it on the other side. Lower the flame as you flip the fillet and sear for another 2 to 3 minutes. Depending on the type of fish, you may adjust the duration. Pan seared fillets taste best when served piping hot. Use your favorite dips, sauces or a curry base to relish these heavenly delights.